Just after World War I, barnstorming became a way of life for many ex-military pilots who wanted to stay in aviation and be employed. Just after the war many pilots bought used military aircraft from the US and European Governments at very cheap prices. 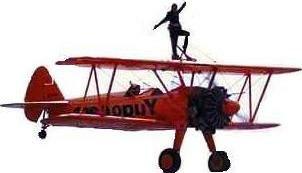 At that time many pilots began performing stunts and participated in aircraft races. The word barnstorming came from the fact that many air shows took place on farms and the audience would gather near the barns to watch the show. These shows were often called The Flying Circus. These Public displays of aerobatics were common during the the late 1920's to the mid 1940's. These flying circuses of civilian flyers demonstrated wing walking and other feats of daring intended to thrill their audiences. Some pilots would fly through the open doors of a barn hoping it wasn't their last flight. The barnstormers defeats were very dangerous and as a result there were many pilots that where killed and a great deal of property damage. With the Air Mail Act of 1926, the low altitude and daredevil acts by the barnstormers began to taper off. The barnstormers earned money by taking passengers for thrill rides, entertained at fairs and air shows. They performed aerobatics that many pilots learned during the war. 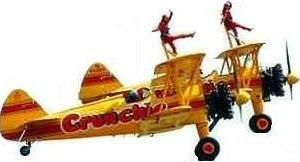 They also performed parachute jumps, wing walking and other stunts. Toward the end of the barnstorming period many pilots began providing flight training, charter flights, opened up FBO's (Fixed Base Operations and other services. This brought in the age of commercial aviation. The Army Air Service had their first air tournament in which it attracted over 10,000 spectators. In contrast, USAF aerial demonstration teams from the beginning have consistently avoided any reference to their skilled formation maneuvers as daredevil "stunt flying." The first such Army Air Corps team, the "Three Musketeers," represented the 1st Pursuit Group at the 1928 National Air Races and in 1932, a pursuit aviation instructor at Maxwell Field, Alabama, Capt. Claire L. Chennault of later Flying Tiger fame, organized the "Men on the Flying Trapeze." Other Pre-WWII Army teams included the "Three Mugs of Beer" and the "Skylarks." However, it was not until the jet era when advances in aircraft and engine design produced fast, highly responsive planes that team demonstrations of precise formation maneuvers reached their height of popularity. The Grumman F8F Bearcat, (1946), Grumman F9F-2 Panther, (1949), Grumman F9F-5 Panther, (1951), Grumman F9F-8 Cougar, (1955), Grumman F11A Tiger, (1957), McDonnell Douglas F-4J Phantom II, (1968), McDonnell Douglas A-4F Skyhawk II. (1974) and The Boeing F/A-18 Hornet (1986) During ceremonies on November 8, 1986, celebrating their 40th anniversary year, the Blue Angels unveiled their present aircraft, the sleek McDonnell Douglas F/A-18 Hornet, the first dual role fighter/attack aircraft now serving on the nation's front lines of defense.